Not sure how far the driver had driven with this burst tyre before stopping. And he was prepared to go further relying on the inner tyre on the set of twins to get him there. But the inner tyre was also totally unsafe. If ever there was an example for the necessity of implementing pre-trip vehicle inspections as a strict policy in every fleet in South Africa, this story is it writes Patrick O’Leary. It was while driving with my mate Benjamin Sibanda that we came up behind a truck driving at about 40kph in an open 80kph zone. We quickly saw why. The left tyre on the rear twins was looking very suspect with tread flapping round and round. Click here to see the short video. 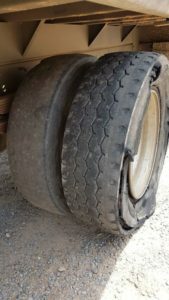 While many drivers will drive to the nearest depot or place of repair when they experience a tyre burst with the knowledge that the good tyre in the twin set will carry them there, this was different. From what we saw, that tread could come off anytime with chunks flying into a following vehicle. It was very dangerous. He had to stop. I overtook him to find a safe place to stop and then saw in the rear-view mirror that he was pulling off the road. Good stuff. We turned round and drove back to have a closer look and a chat with the driver. 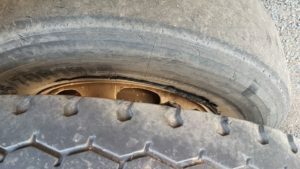 A burst tyre next to a bald, illegal tyre with a cut on the inner sidewall. The tyre burst would have happened on the trip but a pre-trip inspection by the driver would have highlighted the dangerous inner tyre. There was no safety margin here. Yes, he knew he was driving with a burst tyre but then asked – not in a very friendly manner of course – if I would move my car as he wanted to turn around and go back. It was then that Benjie called to me from the back of the truck saying there was another problem. The inner tyre was not safe either. I went back to have a look and apart from being totally bald, it had a bad cut running on the sidewall close to the rim edge. I went back to the driver’s side and said to him that he can’t drive anywhere as both tyres were finished. I was not moving my car. Obviously he wasn’t too happy with that but when I explained to him about the potential consequences of him driving on – including the loss of his life or someone else’s life on the road – he started easing up to the point where we became mates – I think! I told him to phone his boss who would have to get a tyre service crew out with two new tyres. I would speak to his boss if necessary. He did that and with a smile, told me that the boss said he must wait and not drive further. New tyres were coming. We were now firm buddies. Note the cut in the sidewall close to the rim. The tyre also had zero tread. The point of this is that yes, you do get instances where a tyre will burst – and I’m not sure what caused this one. 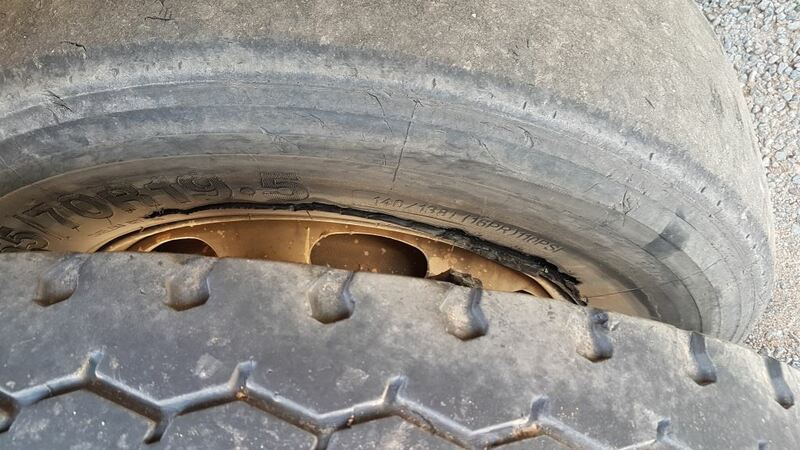 However, if the driver had done a full pre-trip vehicle inspection before setting off, he would have noticed the bald inner tyre with the vicious cut and known there was no safety margin in the event of one tyre bursting. He could have then notified his boss – or mechanic – and had it changed before setting off on his trip. As it was, apart from the burst tyre, he was driving with another totally illegal and dangerous tyre so even if he had a spare to fit, it wouldn’t have helped. He’d need two spare tyres to get back onto the road with a safe vehicle. FleetWatch has stated in the past that if pre-trip inspections were done by all drivers of trucks, it would go a long way to preventing crashes on our roads. 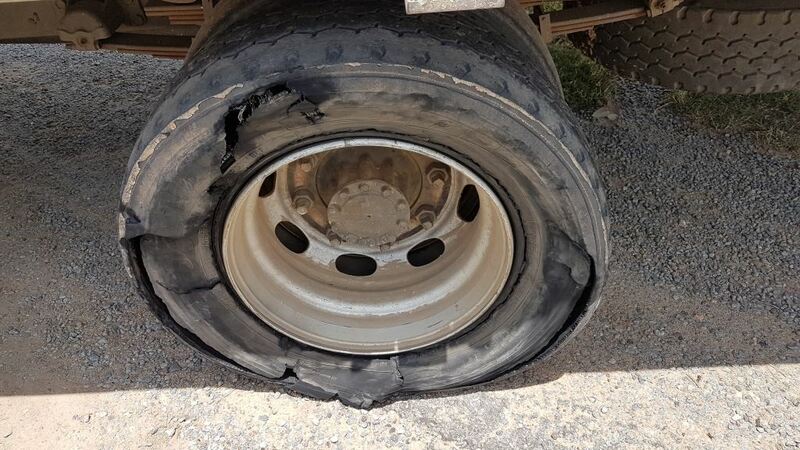 If we hadn’t have been there, this driver would have driven back to his depot – or wherever he had in mind, with one burst tyre and another one set to burst. FleetWatch uses this story to make a call to all companies operating trucks to implement a pre-trip inspection policy for their drivers as a must. This incident highlights the need for such a policy. Please do it.